How to save photos to computer from iPhone with iOS 10.2.1? How to transfer iPhone photos to computer running iOS 10.2.1? Read here to export photos from iPhone 7 to computer easily. How to save photos to computer from iPhone 7 with iOS 10.2.1? Usually, most people hold the idea of transferring all photos from iPhone to computer so as to save more space for videos, movies and songs downloaded. We all know that it is not easy to export all iPhone photos to computer, unlike Android phones. Thus, is there any way to save all photos to computer from iPhone 7 running iOS 10.2.1? Definitely yes. Just keep reading here and you will fresh up your mind to get a way to transfer photos to PC at ease. In order to transfer photos to computer from iPhone 7 with iOS 10.2.1, of course, you need the help from iFonebox, a professional iPhone data recovery and iPhone data management tool. As a powerful iPhone data transferring software, iFonebox enables you to transfer all data like photos, videos, wechat data, contacts, etc, from iPhone/iPad/iPod Touch. Plus, it is also a great helper to recover deleted or lost data from iPhone directly or iPhone backup selectively, so cool. Next, detailed steps are listed below to help you export photos from iPhone 7 to computer at ease. But before that, undoubtedly, it is necessary to download and install iFonebox on your computer. There are two versions available: Windows version and Mac version. How to save photos to computer from iPhone 7 running iOS 10.2.1? --Run iFonebox. Choose Recover from iOS Device mode. Bear in mind to plug in your iPhone to the computer so as to scan and transfer photos from it to computer. If it the first time to connect iPhone to the computer, please click Trust the computer on your iPhone screen. Click Start button to go. --Scan photos from iPhone. Please click on Photos item to start scanning and analysis process. If you have a large data for photos, it will take longer time to scan. Just be patient. --Preview and select photos to transfer. 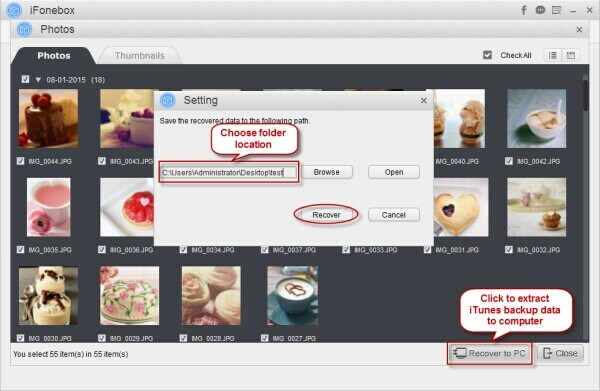 You can choose all those photos and then click Recover to PC button to save all photos from your iPhone to computer. In a word, it is not a big deal to transfer all photos to PC from iPhone within the help from iFonebox, amazing and convenient.